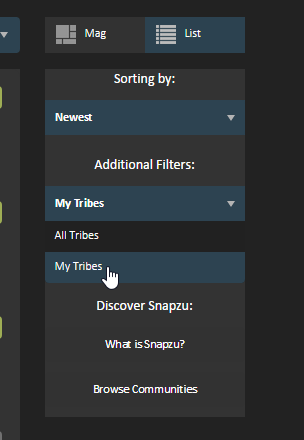 Is there any way to change the tribes shown at the top to the tribes you've joined? I was thinking the same, they should definitely implement that! If not, suggest it over at /t/ideasforsnapzu! Not sure if this is exactly what you are looking for, but on the right side of Mag view you can find this drop down menu. I think it defaults to that later on, as well.